We have dedicated our program to building a foundation of donor females that can impact any program concentrating on genetics, phenotype and balanced data. • 64 Y is a powerhouse female that is a maternal sister to our National Champion herd sire Lock N Load. 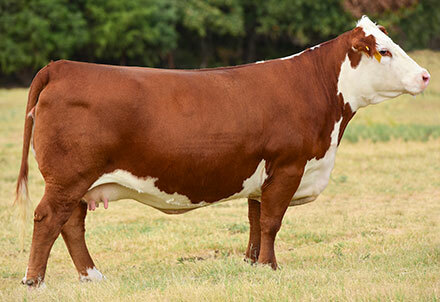 She is sired by the incomparable sire Outcross and is backed by a cow family that is as consistent as any in the elite line up of donors for Star Lake Herefords Oralee is a full sister to Star Lakes Geisha cow and has raised National Champion genetics. 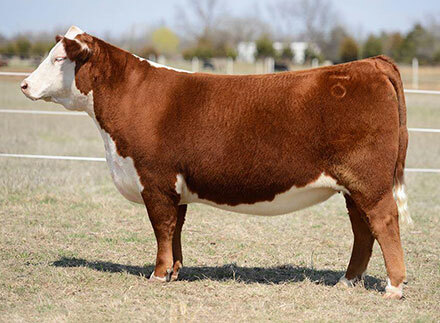 • Great potential in this royally bred young donor female that is going to be a performance giant in our program she will be sure to create both outstanding females and bulls alike. • 64Y ranks in the top 1% of the breed for growth traits while still staying in the top 10% for milk and growth and ranks in the top 1% for the economic trait CHB$. • Call for information on embryos and or flushes. • A female that has been campaigned very successfully this past winter, being named Senior Heifer Calf Champion at the 2015 FWSS and Champion Fall Heifer at the 2015 OYE. 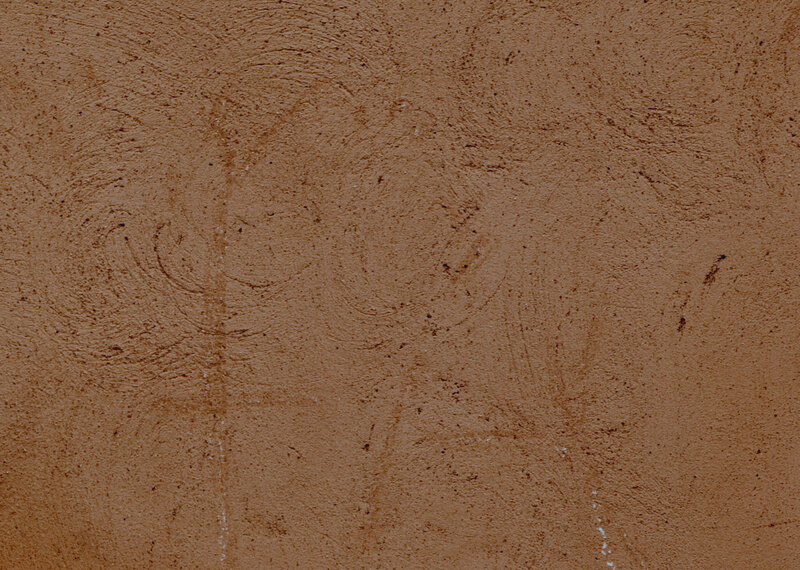 • One we feel has an unprecedented amount of brood cow quality and potential. Bred to Sensation for her first calf, and one of the many highly anticipated matings we have for 2015. • A unique female with a place in the future of TFR! • An outstanding up and coming donor for Turkey Feather. 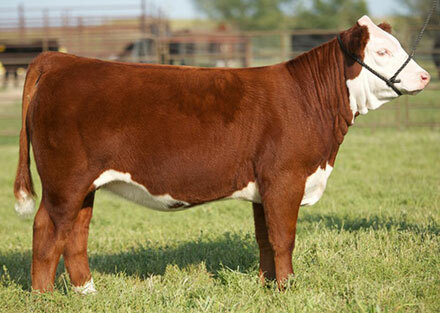 She and her full sister both from Langford Herefords shared a successful run in the show ring in the 2011-12 season. Being division or res division many times at the major stock shows. • Ranks in the top 10% of the breed for weaning weight. • Extremely powerful and high performing. • Look for her influence in our program. 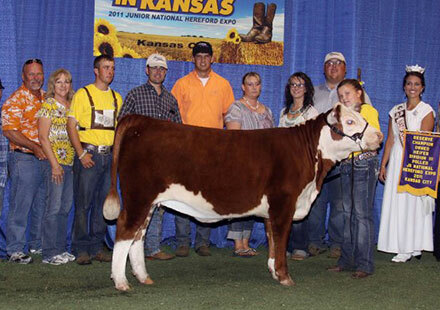 • Dam was the 2007 National Champion Polled Hereford Female. 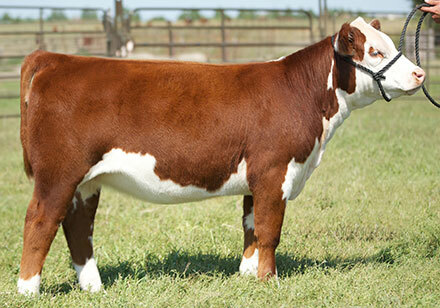 • A tremendous female that was our pick of the horned heifer calves in the 2014 Hoffman Ranch Female Sale. The extra stoutness, body mass, and shear dimension this female offers in a well balanced package is unmatched. We feel she has tremendous potential as a future donor in our operation with a modern phenotype and world class pedigree backing her! • Direct daughter of AH JDH MS 19D VIOLET 6T ET. • Dam is a full sib to "Cracker Jack", who sired the 2014 NWSS Champion Female and the 2014 Jr. National Hereford Expo Champion Female. • Unbelievable quality, balance and eye appeal. • A cow family to hang your hat on! MRS Bojo 414 "Sha Nay Nay"
• 2015 National Maine-Anjou show Champion Maintainer Female. 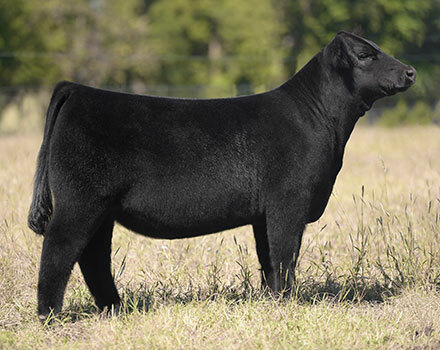 • A stout made, big centered female who is unrivaled from a quality and balance standpoint! • We may not have many Maine females, but we have focused on finding the very best to build the foundation of our Maine program. want more information? Thank you for visiting our site and learning more about our program. If we can assist you with learning more about our Hereford cattle please contact Rindy Bacon at turkeyfeatherranch@yahoo.com.